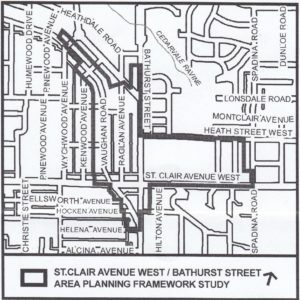 The City of Toronto Planning Department will be hosting a Community Consultation Meeting on the future development of the St. Clair West/ Bathurst/Vaughan Road area. We are expecting high rise plans for the former Petro Canada gas station lot and the Loblaws properties on St. Clair. We have seen the Preliminary Report on the Application to develop the Petro Canada property. The study area will also include the area north of the Bathurst and Vaughan intersection to Claxton Blvd. The Purpose of the Study is to establish a new planning framework that will establish a vision for the study area and guide new development. The Study also seeks to identify public realm improvements and opportunities that will enhance the pedestrian experience in the area. The City is holding an Open House and Presentation to introduce the Study and and receive input from the community.